Note that batteries are on pre-order as we are currently sold out. Batteries ship in 3 weeks. Note: Cost of bike not included in price. This gives you the flexibility to pick a bike as expensive or as inexpensive as you choose. If you're not located in Saskatoon, you will be charged a nominal shipping fee and the kit with complete instructions will be mailed out to you. I am a 67 year old retiree. Before I had my bike upgraded by Biktrix, I used to barely ride 2 blocks and be worn down. I was always sceptic to bike any farther as I was scared that I wouldn't have the energy to ride back home. Now, with a Biktrix bike, I ride 30-40km daily on a regular basis and sometimes even 50km. I could not be happier with this purchase. The product is amazing and the support is outstanding. My wife cannot ride a regular bike due to her heart health condition. Over the years, we have tried several ebike conversion kits on her tricycle but had several problems including burnt controller, broken spokes etc. 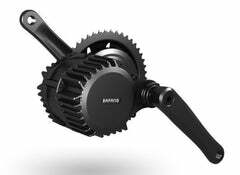 With the Biktrix mid motor, we have had no problems. My wife has been riding her tricycle for a month now and everthing works smooth. Thank you Biktrix for enabling my wife to be mobile again. As an owner of an electric bike from Costco, I have become a huge fan of ebikes. I decided to buy my wife an ebike but did not want to buy a new bike if I could get her existing bike converted to an electric. We dropped off my wife's bike at Biktrix and picked it up the following day. I must say that her bike is much lighter than mine and the mid motor allows me to use all the gears on the rear wheel like a motorcycle. This is much better than the hub motor on my bike. I have researched quite a lot on electric bikes and motors and the product Biktrix sells is definitely the best in class in terms of quality and price. I must mention, on the second day of using the bike, the fuse on the battery came lose. Biktrix service was excellent - they replaced the fuse holder and had me up and running in minutes. I will surely recommend Biktrix. I bought one of these kits about a month ago, and had it installed on my commuter bike. I'm extremely pleased with it. The biggest thing for me is how fun it is to ride with this motor. It's really peppy; feels almost like riding a small motorbike. And it's fairly light too, so I can easily maneuver my bike, and pick it up and carry it around when needed. The battery life is good; it varies depending on what assist level I use and how much I use the throttle, but I can get several days of use out of it without a recharge. I had a Biktrix mid motor kit installed on my wife's bike. It is very peppy and fun to ride. I find myself stealing the bike away occasionally for a quick ride. I am considering getting one for me. I definitely recommend this kit for anyone.